A vise that is built into a carpenter or joiner's bench. Optimised for holding timber. A vise that has a lever under the turn screw to disengage it so that the jaws can be move quickly without using the threads. A simple vise that reaches to the floor. Often home made by the user. A complicated vise that allows the rotation of the jaws and objects held in them. A standard vise that does not have a quick action lever. Above is a photo of a fairly new bench set-up with a standard vise. Also if I am not much mistaken is a Lee Valley smoothing plane which has an enviable reputation for quality with my North American friends. 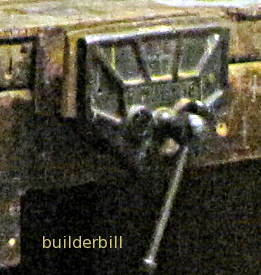 To the right is a not too great shot of a standard woodworking vise. Not seen really well is just below the central bolt that cranks the outer jaw in and out is a lever that disengages a pawl that fits the thread so that the outer jaw can be opened wide without going to the trouble of making many turns. 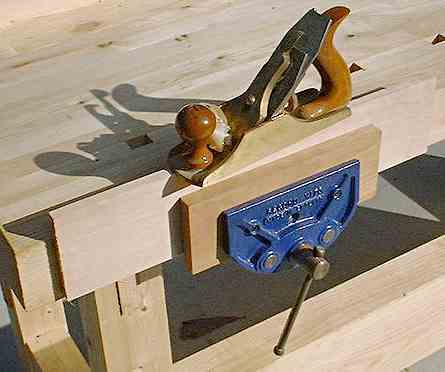 The joiner's vise is always fixed flush with or slightly lower than the bench that it is fitted into. This is so that when not in use it does not interfere with the work of assembling wide frames and doors. The steel jaws always have timber pieces fitted to them to protect the work. They are changed when they get worn. 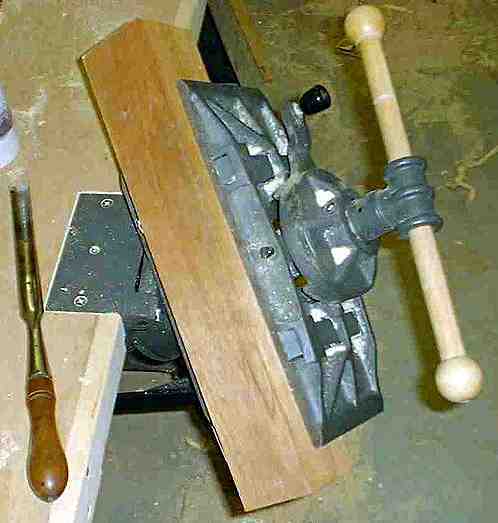 To right again is what is known as a Leg Vise. All of these that I have ever seen consist of a store bought thread and a nut and washer mechanism and then the owner builds the rest themselves. I once made one that worked great using the washers, nuts and threaded bar similar to what is seen on my wall formwork page. Some of the moving front jaws I have seen have been fixed to a hinge on the floor and some have been hinged to the back jaw. The one here has a pin arrangement so that there is no actual slope to the front jaw. A pin is placed in any number of holes to keep the jaw vertical for differing widths of timber being clamped. Below is a photo of a Tail Vise These are fixed at the end of a bench and work as a stand alone vise, or as in the photo they have a pin in the movable jaw that works in conjunction with Bench Dogs to hold longer pieces of work. The tail vise reaches down to the floor to minimise the angle of lean on the moving jaw, but it is not to be confused with a Blacksmith's Vise which also rest on the floor. A pair of Bench Dogs along with maybe a packer or two and a pair of Fox Wedges can also be used for holding longer stock firmly. It really depends on the layout of the holes in the bench-top for the dogs. The dogs themselves are made to have different heights above the surface to suit different thickness' of timber. 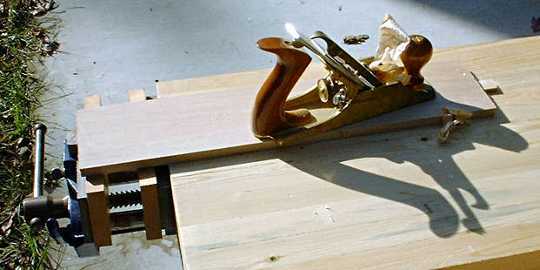 A Tail Vise working in conjunction with a Bench Dog. A "sort of" Pattern Makers vise. In the days before electronically controlled machines for making very precise articles out of various materials a Pattern Maker would make highly complex and accurate patterns for the engineering industry. He would be a guy that worked in a part of a factory that made castings in iron, steel or brass. 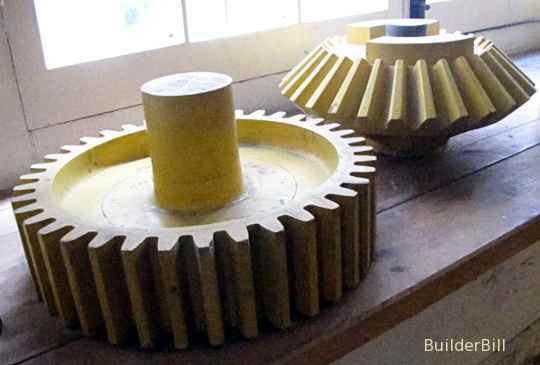 A couple of wooden patterns for cog wheels. Just about every conceivable shape from small to large can be cast in metal and before the mould is made the patten maker had to make the patterns out of mainly wood. The vis that he used when working on complex parts had to have the ability to hold odd shapes at different angles.